By Keith Cowing on February 28, 2013 10:57 AM. "However, of the 67 sampled awards, we identified 20 that were made to firms that self- certified as being owned and controlled by women. Of those 20, we found indications that 7 (35 percent) may have been to companies that falsely self-certified their eligibility as a woman-owned small business." By Keith Cowing on February 21, 2013 4:12 PM. "As part of the Obama Administration's recognition of the critical role that space technology and innovation will play in enabling both future space missions and bettering life here on Earth, NASA Administrator Charles Bolden has announced the creation of the Space Technology Mission Directorate. The directorate will be a catalyst for the creation of technologies and innovation needed to maintain NASA leadership in space while also benefiting America's economy." By Keith Cowing on February 19, 2013 12:09 PM. "Sustainable public advocacy will depend upon around bold goals and clear plans that warrant substantial investments. Writing in Reason magazine, Gregory Benford correlated public interest in space exploration with a natural desire for vicarious adventure. Benford observed that: "Much of the passion in science fiction springs from a deep-rooted human need: to reach out, to prefer movement to stasis, to understand." Accordingly, he concludes that NASA has a choice: "swing for the bleachers or die." "On Thursday, the children arrived in the big recreation room and found a spacesuit waiting for them. "There's no one inside. That's fake!" one girl insisted. "I"m right here," said Leland Melvin, standing behind her, delighted at her defiant challenge. Melvin is an astronaut. "What do you think I do in this blue suit?" he asked, pointing to his flight suit. "Nothing," a bunch of kids wisecracked. It's a tough crowd. Every year, Melvin brings a NASA spacesuit and a slide show of his adventures in space. It doesn't hurt that he also tells the kids about his time in the NFL, getting drafted to play with the Detroit Lions. And then getting injured." Keith's note: If you ask NASA for their plan - i.e. their strategy - guidance - goals - for engaging the public in education and public outreach activities they cannot provide you with one. Yet they always tell you (they think) that some one is working on one - but it doesn't cover everything that NASA does because NASA is incapable of adopting an agency-wide strategy or plan. And even if something resembling a plan starts to emerge, it never goes beyond draft stage due to infighting and turf disputes. After 4 years the NASA Advisory Council Committee on Education and Public Outreach has done absolutely nothing to address this situation. They are meeting in Washington in a week or so. Not sure why they even bother. All this being said, you still see poignant attempts to go beyond the normal audiences such as Leland Melvin did at this homeless shelter. Alas, these activities go unnoticed since NASA is clueless as to how to inform others that they even take place. Oh yes - OMB is going to significantly cut NASA's Education budget for FY 2014 - again. And yet they will tell you with a straight face that the White House supports education blah blah blah. I guess its hard to totally blame NASA when the White House won't even stand behind its own rhetoric. By Keith Cowing on February 18, 2013 8:41 PM. Keith's note: Official AXE slogan: "Leave a man. Come back a hero." (Sigh) So much for the other half of humanity. I guess girls need not apply to this promotional stunt for a chance to fly into space. By Keith Cowing on February 14, 2013 3:50 PM. Keith's note: What are the odds that a tweet by both @ISS_CASIS and @GoldenSpikeCo - tweets that are exactly identical to each other - could be posted simultaneously using the same Twitter App? I called @ISS_CASIS on this and their tweet suddenly disappeared. Here is a screen grab I took from TweetDeck just before @ISS_CASIS deleted their tweet. Is CASIS (paid by NASA to do ISS utilization) now supporting commercial Moon exploration efforts? 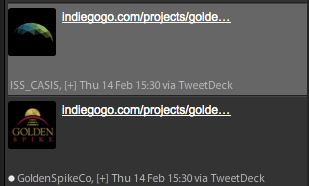 Keith's update: Apparently this was a Tweetdeck glitch (yes they happen). By Keith Cowing on February 13, 2013 4:58 PM. "Curry agrees: "In the future, you can envision almost all computing being done in the cloud, much of which could be powered by OpenStack. I think that NASA will need to receive significant credit for that in the history books. What we've been able to do is unbelievable-- especially when you remember that it all started in a NASA lab." "Ray O'Brien, acting CIO at NASA Ames, when asked May 30 by InformationWeek about NASA's participation, used diplomatic language to say that NASA still endorsed the project, was proud of its founding role, and might be a user of OpenStack components in the future. "It is very possible that NASA could leverage OpenStack as a customer in the future," he wrote in his email response. Then, in a June 8 blog, NASA CIO Linda Cureton dispensed with the diplomacy: "NASA [has] shifted to a new Web services model that uses Amazon Web Services for cloud-based enterprise infrastructure," she wrote." Keith's note: I find it rather odd that NASA brags about developing OpenStack in its Spinoff 2012 document but does not bother to inform the reader (taxpayer) that the agency actually dumped OpenStack. By Keith Cowing on February 13, 2013 4:27 PM. "Griffin, a persistent critic of President Obama's space program, said the current system consists of companies such as SpaceX operating with "government as their venture capitalist." "Griffin's press secretary, David Mould, told the Associated Press that Griffin isn't campaigning and expects the incoming president to name a new administrator. But Griffin would be "honored" to be asked to stay on, Mould said. "A lot of people seem to like and support Mike and think he's doing a good job," he said." Keith's note: Why would Mike Griffin be "honored" to have been Obama's choice if he is so against what President Obama is doing i.e. continuing - and expanding upon - the pro-commercial (pro-business) space policies started under the Bush II Administration? Indeed, Mike Griffin personally signed a number of these agreements. Baffling. Israel-Led Team Leading Google Lunar X Prize Race? By Keith Cowing on February 12, 2013 10:19 PM. "SpaceIL is a nonprofit foundation, and is relying on donations to get into space, explained Margalit. So far, about $20 million of the $30 million needed to run the project has been raised. On SpaceIL's Facebook page, visitors are encouraged to make a donation in multiples of "chai" -- 18 shekels or dollars. The organization does not plan on keeping the GoogleX prize if it does win, stated Winetraub; instead, it will channel that money back into science education, and conduct more programs to expose more kids to the importance of space travel and research." By Keith Cowing on February 12, 2013 6:15 PM. "NASA's shift to open-source content management is back on after the incumbent contractor withdrew a bid protest on Feb. 4. 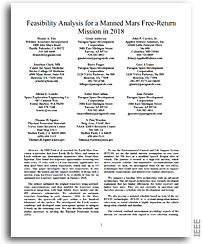 The withdrawal of the protest, filed by e-Touch Federal Systems on Dec. 28 after NASA awarded Rockville-Md.-based InfoZen a $40 million blanket purchase agreement, allows InfoZen to begin replacing NASA's existing content management system with open source architecture to run its 140 websites and 1,600 web assets and applications." This page is an archive of entries in the Commercialization category from February 2013. Commercialization: January 2013 is the previous archive. Commercialization: March 2013 is the next archive.